Left upper extremity shows necrotizing fascitis in an individual who used illicit drugs. Cultures grew Streptococcus milleri and anaerobes (Prevotella species). Patient would grease, or lick, the needle before injection. Type III necrotizing fasciitis, or clostridial myonecrosis, is gas gangrene. This skeletal muscle infection may be associated with recent surgery or trauma. In a study of 20 patients with necrotizing fasciitis with a median age was 52.5 years, the overall mortality rate was only 8.3%, attributed to early diagnosis and treatment. Half had a comorbidity such as diabetes mellitus or congestive heart failure. Patients with necrotizing fasciitis tend to present with erythema and supralesional vesiculation or bullae formation 2-3 days following constitutional symptoms of fever and chills. 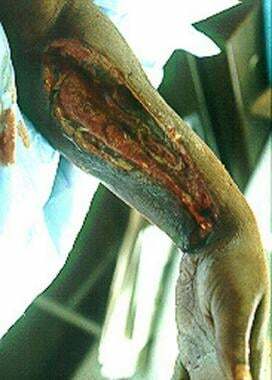 Serosanguineous fluid may drain from the affected area. From a rapidly advancing erythema, painless ulcers may appear as the infection spreads along the fascial planes. A black necrotic eschar may be evident at the borders of the affected areas, and metastatic cutaneous plaques may occur. Purpura with or without bullae formation, occasionally with a lack of cutaneous erythema and heat, may be found, but this does not preclude the diagnosis of necrotizing fasciitis. Gas may be evident; this process may also be observed in the perineum in association with urogenital or anogenital infections (eg, Fournier gangrene). Massive perineal ulceration with foul-smelling discharge in a 60-year-old woman who had undergone postvaginal hysterectomy and repair of a rectal prolapse. Cultures revealed Escherichia coli and Bacteroides fragilis. The diagnosis was peroneal gangrene. Necrotizing fascitis at a possible site of insulin injection in the left upper part of the thigh in a 50-year-old obese woman with diabetes. However, in many cases, no association with such factors can be made. Necrotizing fasciitis may also occur in the setting of diabetes mellitus, surgery, trauma, or infectious processes. Necrotizing fasciitis causes thrombosis of fascial blood vessels, producing a true surgical emergency. Although thickening of the deep fasciae as a result of fluid accumulation and reactive hyperemia may be visualized using computed tomography and magnetic resonance imaging, these findings are not specific for necrotizing fasciitis. Thus, although imaging studies can confirm the diagnosis and evaluate spread, they should not delay emergency surgical treatment. Kihiczak GG, Schwartz RA, Kapila R. Necrotizing fasciitis: a deadly infection. J Eur Acad Dermatol Venereol. 2006 Apr. 20(4):365-9. [Medline]. Oud L, Watkins P. Contemporary trends of the epidemiology, clinical characteristics, and resource utilization of necrotizing fasciitis in Texas: a population-based cohort study. Crit Care Res Pract. 2015. 2015:618067. [Medline]. [Full Text]. Audureau E, Hua C, de Prost Nicolas N, Hemery F, Decousser JW, Bosc R, et al. Mortality of Necrotising Fasciitis: relative influence of individual and hospital-level factors, a Nationwide Multi-Level Study, France, 2007-2012. Br J Dermatol. 2017 Apr 27. [Medline]. Fais P, Viero A, Viel G, Giordano R, Raniero D, Kusstatscher S, et al. Necrotizing fasciitis: case series and review of the literature on clinical and medico-legal diagnostic challenges. Int J Legal Med. 2018 Apr 7. [Medline]. Federman DG, Kravetz JD, Kirsner RS. Necrotizing fasciitis and cardiac catheterization. Cutis. 2004 Jan. 73(1):49-52. [Medline]. Chan HT, Low J, Wilson L, et al. Case cluster of necrotizing fasciitis and cellulitis associated with vein sclerotherapy. Emerg Infect Dis. 2008 Jan. 14(1):180-1. [Medline]. Bharathan R, Hanson M. Diagnostic laparoscopy complicated by group A streptococcal necrotizing fasciitis. J Minim Invasive Gynecol. 2010 Jan-Feb. 17(1):121-3. [Medline]. Akcay EK, Cagil N, Yulek F, et al. Necrotizing fasciitis of eyelid secondary to parotitis. Eur J Ophthalmol. 2008 Jan-Feb. 18(1):128-30. [Medline]. Anwar UM, Ahmad M, Sharpe DT. Necrotizing fasciitis after liposculpture. Aesthetic Plast Surg. 2004 Nov-Dec. 28(6):426-7. [Medline]. Bisno AL, Cockerill FR 3rd, Bermudez CT. The initial outpatient-physician encounter in group A streptococcal necrotizing fasciitis. Clin Infect Dis. 2000 Aug. 31(2):607-8. [Medline]. Gibbon KL, Bewley AP. Acquired streptococcal necrotizing fasciitis following excision of malignant melanoma. Br J Dermatol. 1999 Oct. 141(4):717-9. [Medline]. Sewell GS, Hsu VP, Jones SR. Zoster gangrenosum: necrotizing fasciitis as a complication of herpes zoster. Am J Med. 2000 Apr 15. 108(6):520-1. [Medline]. Tung-Yiu W, Jehn-Shyun H, Ching-Hung C, et al. Cervical necrotizing fasciitis of odontogenic origin: a report of 11 cases. J Oral Maxillofac Surg. 2000 Dec. 58(12):1347-52; discussion 1353. [Medline]. Tang WM, Fung KK, Cheng VC, et al. Rapidly progressive necrotising fasciitis following a stonefish sting: a report of two cases. J Orthop Surg (Hong Kong). 2006 Apr. 14(1):67-70. [Medline]. Kim HJ, Kim DH, Ko DH. Coagulase-positive staphylococcal necrotizing fasciitis subsequent to shoulder sprain in a healthy woman. Clin Orthop Surg. 2010 Dec. 2(4):256-9. [Medline]. [Full Text]. Eltayeb AS, Ahmad AG, Elbeshir EI. A case of labio-facial necrotizing fasciitis complicating acne. BMC Res Notes. 2016 Apr 23. 9 (1):232. [Medline]. Dahm P, Roland FH, Vaslef SN, et al. Outcome analysis in patients with primary necrotizing fasciitis of the male genitalia. Urology. 2000 Jul. 56(1):31-5; discussion 35-6. [Medline]. Prasanna Kumar S, Ravikumar A, Somu L. Fungal necrotizing fasciitis of the head and neck in 3 patients with uncontrolled diabetes. Ear Nose Throat J. 2014 Mar. 93(3):E18-21. [Medline]. Yu SN, Kim TH, Lee EJ, Choo EJ, Jeon MH, Jung YG, et al. Necrotizing fasciitis in three university hospitals in Korea: a change in causative microorganisms and risk factors of mortality during the last decade. Infect Chemother. 2013 Dec. 45(4):387-93. [Medline]. [Full Text]. Zhang M, Chelnis J, Mawn LA. Periorbital Necrotizing Fasciitis Secondary to Candida parapsilosis and Streptococcus pyogenes. Ophthal Plast Reconstr Surg. 2015 Apr 20. [Medline]. Bucca K, Spencer R, Orford N, Cattigan C, Athan E, McDonald A. Early diagnosis and treatment of necrotizing fasciitis can improve survival: an observational intensive care unit cohort study. ANZ J Surg. 2012 Sep 19. [Medline]. Iwata Y, Sato S, Murase Y, et al. Five cases of necrotizing fasciitis: lack of skin inflammatory signs as a clinical clue for the fulminant type. J Dermatol. 2008 Nov. 35(11):719-25. [Medline]. Heiner JD, Eng KD, Bialowas TA, Devita D. Fournier's Gangrene due to Masturbation in an Otherwise Healthy Male. Case Rep Emerg Med. 2012. 2012:154025. [Medline]. [Full Text]. Malghem J, Lecouvet FE, Omoumi P, Maldague BE, Vande Berg BC. Necrotizing fasciitis: Contribution and limitations of diagnostic imaging. Joint Bone Spine. 2012 Oct 5. [Medline]. Zahar JR, Goveia J, Lesprit P, et al. Severe soft tissue infections of the extremities in patients admitted to an intensive care unit. Clin Microbiol Infect. 2005 Jan. 11(1):79-82. [Medline]. Fustes-Morales A, Gutierrez-Castrellon P, Duran-Mckinster C, et al. Necrotizing fasciitis: report of 39 pediatric cases. Arch Dermatol. 2002 Jul. 138(7):893-9. [Medline]. Ford LM, Waksman J. Necrotizing fasciitis during primary varicella. Pediatrics. 2000 Jun. 105(6):1372-3; author reply 1373-5. [Medline]. Bahebeck J, Sobgui E, Fonfoe L, et al. Limb-threatening and Life-threatening Diabetic Extremities: Clinical Patterns and Outcomes in 56 Patients. J Foot Ankle Surg. 2010 January - February. 49(1):43-46. [Medline]. Fernando SM, Tran A, Cheng W, Rochwerg B, Kyeremanteng K, Seely AJE, et al. Necrotizing Soft Tissue Infection: Diagnostic Accuracy of Physical Examination, Imaging, and LRINEC Score: A Systematic Review and Meta-Analysis. Ann Surg. 2018 Apr 18. [Medline]. Touil LL, Gurusinghe DA, Sadri A, El-Gawad A, Fahmy FS. Postsurgical Pyoderma Gangrenosum Versus Necrotizing Fasciitis: Can We Spot the Difference?. Ann Plast Surg. 2017 May. 78 (5):582-586. [Medline]. Left lower extremity in a 56-year-old patient with alcoholism who was found comatose after binge drinking. Surgical drainage was performed to treat the pyomyositis-related, large, non–foul-smelling (sweetish) bullae. Gram staining showed the presence of gram-positive rods. Cultures revealed Clostridium perfringens. The diagnosis was clostridial myonecrosis. Necrotizing fascitis of entire thoracolumbar posterior area in 20-year-old patient with chronic myelogenous leukemia and neutropenia (white blood cell [WBC] count, 680/µL). Cultures revealed gram-negative Pseudomonas species and Bacteroides fragilis.